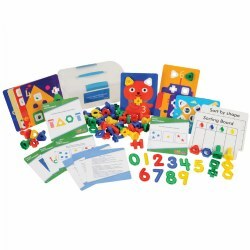 Assist students with their counting, matching, basic operations, and more with Kaplan's selection of various hands-on activity sets and games. 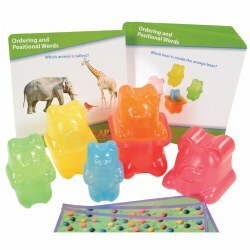 Products also include workbooks, flash cards, and timed math drills. 3 years & up. 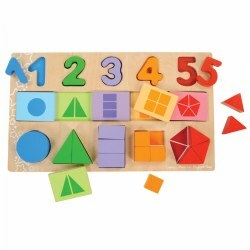 Children will develop beginning math skills such as observing attributes, creating patterns, and matching and sorting objects. 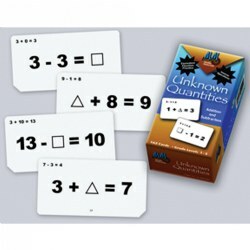 The materials in this toolbox engage children in math activities with eight interactive cards and a set of manipulatives that provide hands-on examples of a variety of math skills. 3 years & up. 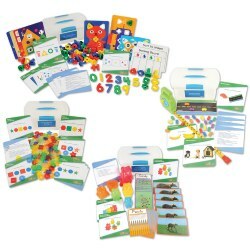 These four Math Toolboxes provide engaging, hands-on math experiences that support seven different math skills. Each Toolbox comes with eight interactive cards and the materials necessary to use them. Extended learning activities are suggested as children master the basic skills. Grades 1 - 3. Students build math skills and get instant reinforcement. Cards can be used independently or as teacher directed flash cards. Box includes 50 double sided cards. Grades 1 - 5. Students build math skills and get instant reinforcement. Cards can be used independently or as teacher directed flash cards. Box includes 50 double sided cards. 4 years & up. 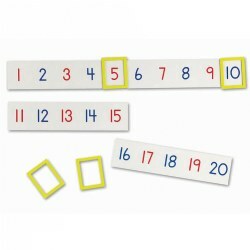 Learn basic counting skills and simple words with this Ten Frame & First Words Dominoes set by Junior Learning. Win each game by getting rid of all of your dominoes first. 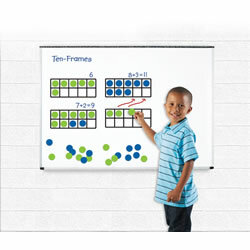 In Ten Frame match the visual interpretations to the correct written numbers on a ten frame. 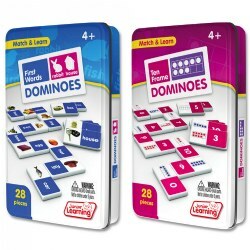 Build your literacy skills in the First Words Dominoes game by matching each basic word to a corresponding image. Promotes individual learning. Included: 2 Tins of Dominoes: 28 Dominoes in each tin. 3 years & up. 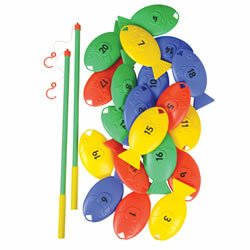 Twenty large numbered fish flop in a make believe pond ready to be caught! 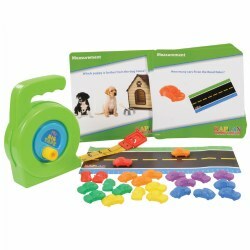 A fun way to learn early math skills, improve hand-eye coordination while engaging in active play. Includes 20 fish, 2 fishing poles and storage bag. Grades PreK & up. 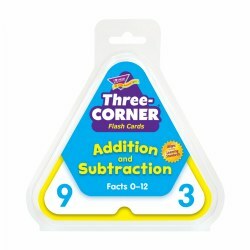 Teach and reinforce essential basic skills with these 20 self checking, five-piece simple addition and subtraction puzzles. 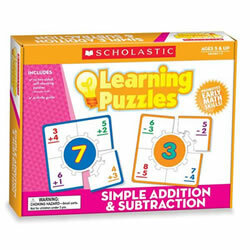 Center piece of each puzzle features a number with four surrounding pieces that show four different ways to compute that number using addition or subtraction. Unique die cuts on each puzzle makes self correction a snap! 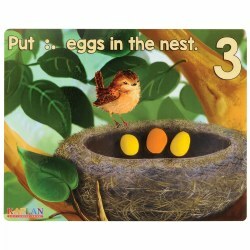 These 8" x 8" plastic coated puzzles are durable and easy for small hands to manipulate. Includes an activity guide. Grades 1 & up. 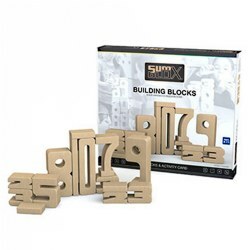 Build math-fact fluency like never before! 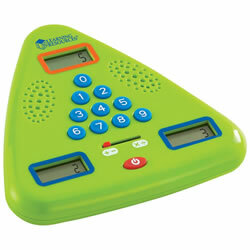 Familiar triangle format provides a visual cue, while game play makes addition and subtraction fun! 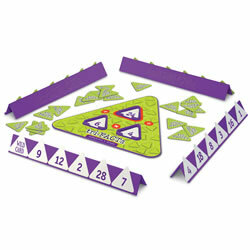 Includes triangle game board, 100 cards (facts up to 20) and 4 trays. For 2-4 players. Grades 3 & up. Multiply, divide, score! 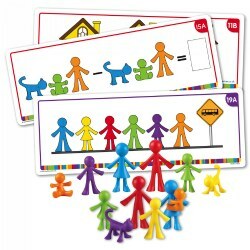 Work with math facts and fact-family concepts like never before. Triangle format is familiar, providing a visual cue, while game play makes tricky multiplication and division fun! 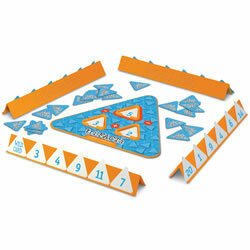 Includes triangle game board, 100 cards (facts up to 100) and four trays. For 2-4 players. Grades K - 4. 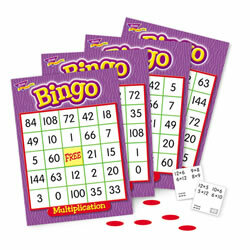 Target reviewing math skills with our fun to play Multiplication bingo game. Increase difficulty by increasing skill levels because each bingo game develops problem solving skills, increases computational speed and really gets students thinking quickly. Each game has everything you need for 36 players with over 200 chips, caller's mat and cards. Made in the USA. Grades 1 - 3. Essential practice in algebraic thinking and problem solving! 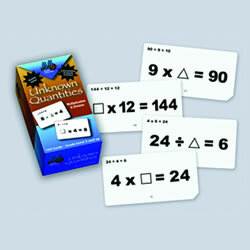 162 easy to read 6 1/4" x 3 1/4" (16cm x 8cm), double-sided flash cards feature equations with missing numerals. Location of missing numeral varies by card. Grades 3 - 5. Essential practice in algebraic thinking and problem solving! 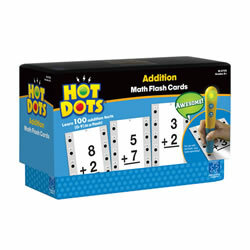 162 easy to read 6 1/4" x 3 1/4" (16cm x 8cm), double-sided flash cards, feature equations with missing numerals. Location of missing numeral varies by card. 3 years & up. 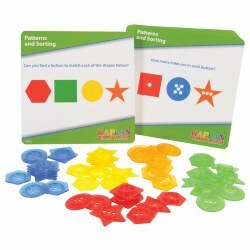 Demonstrate counting, operations, and equations in a visually engaging way with this set of 24 magnets. Suitable for use on any magnetic surface, each strip is printed with 5 numbers and measures 9 1/2"L x 2 1/4"H.